I moved to North Carolina 11 years ago. I had never seen a "Mill Town" before. I had been to some coal towns in the Appalachians when I was a kid with my parents. They took us to see a company coal town in 1964 around the time Lyndon Johnson was cranking out his "War Against Poverty." We went home greatly appreciative of all that we had. Time, though, has a way of erasing and replacing the bad memories with Nostalgia. I have seen many of the former mill towns here in North Carolina, most notably Mooresville, which was a bustling place through the early 1960's. It was a mill town, a railroad town and a farming community. All of that changed when Lake Norman was built and the Interstate came through several miles to the West about 45 years ago. But I have walked the streets of, and worked in Mooresville for a good portion of my time here and always wondered what it was like in its' prime. "Linthead" gives me some answers. 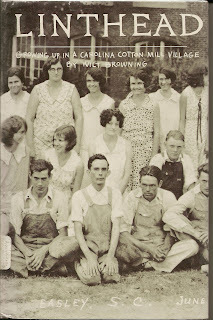 In less than 200 pages Mr. Browning has painted a wonderful, sepia tinged potrait of the mill town of Easley, South Carolina in the 1940's and 50's. His was the last generation of true "lintheads". Lintheads were the people who worked in the mills. The carpenters, loom hands and spinners all came home each day covered in the white lint of the mill. This was a time of Company Stores, scrip instead of cash, hog boiling time and baseball. It was also the generation that would witness the demise all these things as they were replaced by Unions,cash,chain stores and the general breaking down of the old order. This is an unusual book written by a man who escaped working in the mills (he became a sports writer) but is clearly proud of the simple way of life which he once knew.I think that is the charm of this book- we all want to go home again- but can't. The way is filled with memories, some good and some bad. The past ways are harder to live with as we age. We have all become a bit softer, yet we want to go back to the struggles of our earlier years. We can't and so Nostalgia is the next best thing.